Dining, Shopping and Living -- all aspects of the warehouse district are under an evolution that has Peorian&apos;s excited. Q: What is the Warehouse District? A: The district runs the stretch of the Bob Michael Bridge to the Cedar Street Bridge. Many of the buildings once used for industry have sat empty for several years but are now being transformed into a booming urban neighborhood. 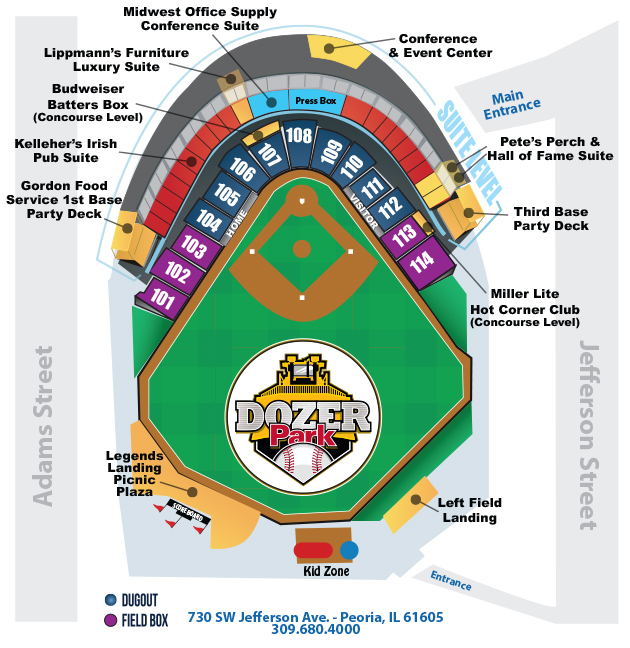 Dozer Park opened in 2002 and can be argued that it was the catalyst for the recent development of the district. Home to the Peoria Chief&apos;s baseball team, Dozer Park also hosts other various events throughout the year. See the Chief&apos;s game schedule here. Moving from it&apos;s previous location near Water Street to a much larger space in the Murray Building. Occupying the first floor, the brewery is over 4,500 square feet in size. They host live music, have a great beer garden and brew over 11 draft beers on site. Located at the corner of Water and State, this bar combines hundreds of different beer with dozens of arcade games. Further down from the &apos;Warehouse District&apos; is an established bar specializing in over 100 unique and flavorful martini&apos;s! Right on the riverfront, this fantastic building also offers live music. See their list of live music here. The newest restaurant opened by local restaurateur Travis Mohlenbrink, is now home in the Sealtest Building on Washington St. This gastropub not only offers fantastic dining options but has over 40 craft beers and an extensive wine and spirit menu. The building has been expertly renovated to keep with the warehouse theme. See the Yelp reviews here. Sugar offers a quick dining service with made from scratch wood fired pizzas, sandwiches, fresh salads and hand-made desserts. They also have outdoor seating to enjoy the fresh scenery on Adams Street. View their menu here. Kelleher&apos;s is the longest running restaurant within the boundaries of the warehouse district. It success is partly to do with the fantastic bar menu, traditional Irish food options and great live music. The building is one of the oldest warehouses, built in the late 1800&apos;s. View their menu & bar specials here. Coming in Summer 2016, this unique concept will combine free trade coffees, wine & spirits with local produced artisan food. The 2,000 square foot coffee bar with be occupying the old Unio Depot hotel directly across from Dozer Park. Located just past the Warehouse district on Water Street, next to the Contemporary Art Center, this eclectic cafe offers lunch and dinner menus, coffee, full bar and of course live music. Check out the music line up here. Located just past the warehouse district in the The River Station (next to Martini&apos;s), The Blue Duck Barbecue Tavern has enhanced Peorian&apos;s dining experience with made from scratch food. Check out their menu . Similar to the 401 SW Water conversion, the warehouse district will offer several residential units. By fall of 2016, it is expected to have 32 residential units in the building with Rhodell Brewery and the future home of Farnsworth Group on Walnut St.
Later this year, 9 units will be completed in the same building as Thyme Kitchen and Craft Beer on Washington. This summer, 28 units are expected to be completed in the Winkler building on Washington St.
By Fall 2016, they are expected to have 44 unit completed on Adams St. Located on Pecan Street, 20 units are expected to be ready late this year. Learn more about the downtown development here. Make a quick trip downtown and re-discover what Downtown Peoria has to offer!